CAPE CANAVERAL — Critical operations were completed this morning by United Launch Alliance at Cape Canaveral to prepare two rockets for upcoming flights into space. 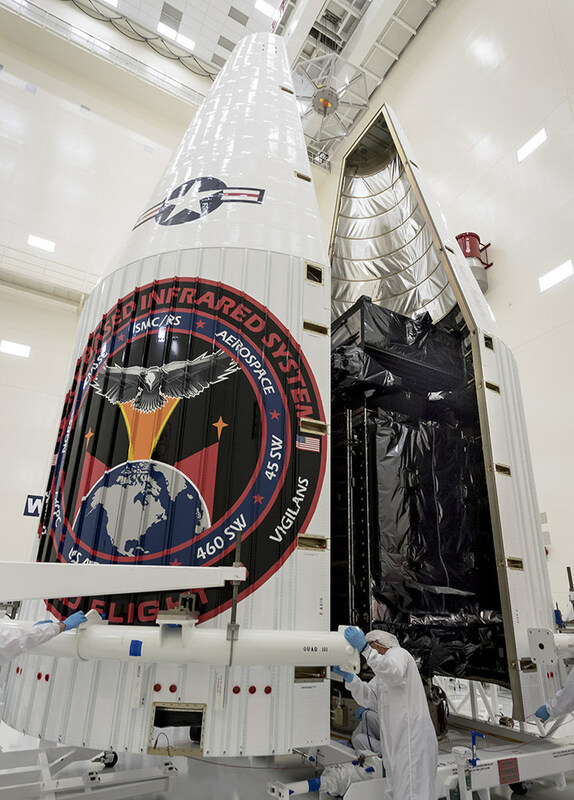 At the Vertical Integration Facility adjacent to Complex 41, the U.S. military’s $1.2 billion SBIRS GEO Flight 3 spacecraft was hoisted atop its Atlas 5 booster for liftoff next Thursday. And down the road at Complex 37, the Delta 4 rocket that will launch a military communications satellite March 8 was hydraulically erected on the pad to begin its pre-flight campaign. The missions will be ULA’s 46th and 47th conducted for the U.S. Air Force over the past decade. 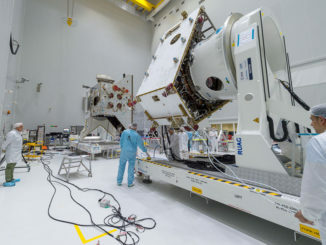 The third Space Base Infrared Systems Geosynchronous Earth Orbit, or SBIRS GEO Flight 3, was delivered to the VIF for mating from the National Reconnaissance Office’s Eastern Processing Facility at Cape Canaveral early today. The craft was encapsulated in the Atlas 5 rocket’s payload fairing on Jan. 7. Crews used an overhead crane to lift the 10,000-pound satellite through the doorway and into the towering building for attachment to the Centaur upper stage. The launch on Jan. 19 is scheduled during a 40-minute window opens at 7:46 p.m. EST (0046 GMT). The Lockheed Martin-built craft will operate 22,300 miles above Earth and use its telescopic infrared vision to detect launching missiles and provide early warning to the threatened area. 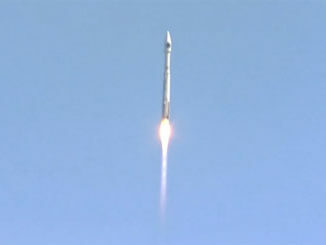 “The satellite’s successful delivery and encapsulation closes out a manufacturing process that Lockheed Martin has continued to streamline with each build, driving significant schedule and cost reductions into the SBIRS program,” said David Sheridan, vice president of Lockheed Martin’s Overhead Persistent Infrared systems mission area. 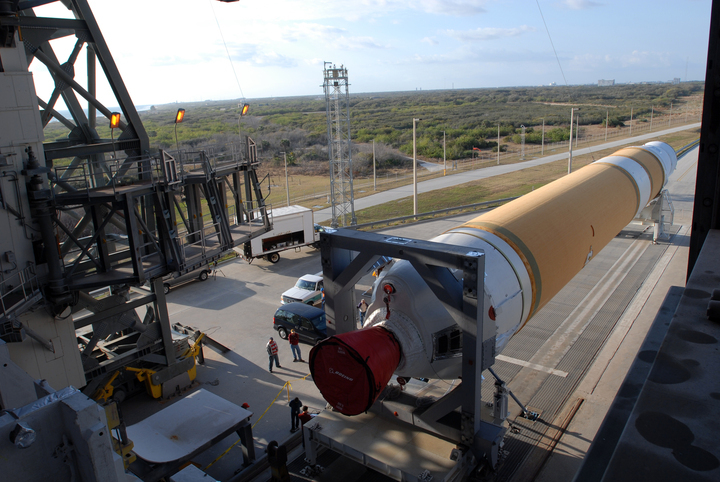 Meanwhile, the two-stage Delta 4 rocket was moved from its Horizontal Integration Facility to the launch pad yesterday and then raised vertically this morning, achieving the Launch Vehicle On Stand milestone. 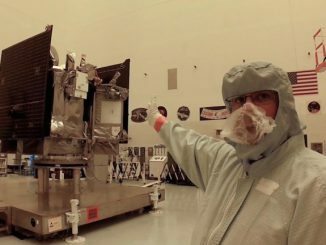 It is scheduled to fly March 8 during a 121-minute window that opens at 6:35 p.m. EST (2335 GMT) to deploy the Wideband Global SATCOM 9 communications satellite. In the coming days, four strap-on solid rocket boosters will be installed to the Delta 4’s first stage. The payload will be attached in late February. WGS 9 was built by Boeing for the U.S. military’s worldwide communications network. But it was funding from Canada, Denmark, the Netherlands, Luxembourg and New Zealand that paid for the satellite’s construction as part of an international agreement. WGS 9 will join its sisters in geostationary orbit 22,300 miles above Earth to provide voice, data and video relay to troops, aircraft, ships and aerial drones. It carries the same upgrade as WGS 8 that nearly doubles its bandwidth as compared to earlier satellites in the series.